New Look For State Bridge and Tunnel Police Cars Painted in State Colors Instead of White and Blue Like NYPD Increases Governor Cuomo Imprint In NYC. NEW YORK CITY — Gov. Andrew Cuomo is painting the Big Apple dark blue and gold. In another sign of Cuomo’s efforts to increase the state’s profile in New York City, all state vehicles have been getting makeover paint jobs showcasing the colors of the Empire State along with the words “New York State” emblazoned in capital letters on their sides. 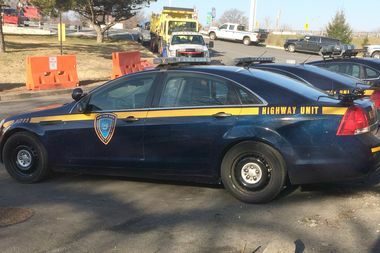 From police cars to dump trucks to snow plows to tow trucks, the state has been transforming the vehicles into dark blue with reflective gold trimmings, especially the ones operated by the Metropolitan Transportation Authority and the state’s Bridge and Tunnel Authority, where tens of millions of people pass every day. “We are now identifying state resources by way of the state colors,” said a source familiar with the initiative. It’s no secret that the governor has been heightening the state’s profile in New York City primarily because of a long-running feud between him and Mayor Bill de Blasio. Cuomo’s first big move came last year when he ordered scores of additional state troopers — with their distinctive grey uniforms and wide brimmed hats — to patrol bustling transit hubs such as Grand Central Terminal, Pennsylvania Station, the Port Authority Bus Terminal and the World Trade Center complex. He became the face of the celebrated opening of the long-awaited Second Avenue subway, and this week trumpeted the upcoming replacement and destruction of the Kosciuszko Bridge connecting Queens and Brooklyn. Andt in recent months, the state has been quietly making over its fleet of vehicles. For example, police cars belonging to state agencies operating bridges and tunnels — that were historically white and blue and resemble NYPD vehicles — have been painted dark blue and gold. Similarly, state trucks, snow plows, and other heavy vehicles positioned primarily at the entrances and exits of the Midtown Tunnel, the Verrazano-Narrows Bridge, and the George Washington Bridge have been transformed to the Empire State’s colors. All future MTA buses — equipped with tech-friendly upgrades such as Wi-Fi, electrical outlets, and USB charging ports — will also be dark blue and gold, replacing today’s white-and-blue fleet, Cuomo and the MTA revealed last March. Last December, the governor announced he was adding 150 troopers to the 50-trooper contingent already in the city, as part of his “Open Road Tolling” that replaces toll booths with license plate readers, insisting it was needed to combat terrorism and catch scofflaws at the city’s bridges and tunnels. “New York City is part of something called the State of New York,” Cuomo, who is up for re-election in 2018, said at the time. Calls to the Governor’s office seeking comment were not immediately returned. The vehicle makeovers come at a time when the governor's office is also pushing its press officers around the state to promote the work of their agencies.